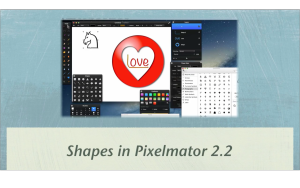 If you watched our previous episode about the new features in Pixelmator 2.2 you’ve seen the new shapes palette, which will pop up automatically every time we activate the shape tool. Now there is more to these shapes that meets the eye. Lets go through some of them and explain how to best use them.